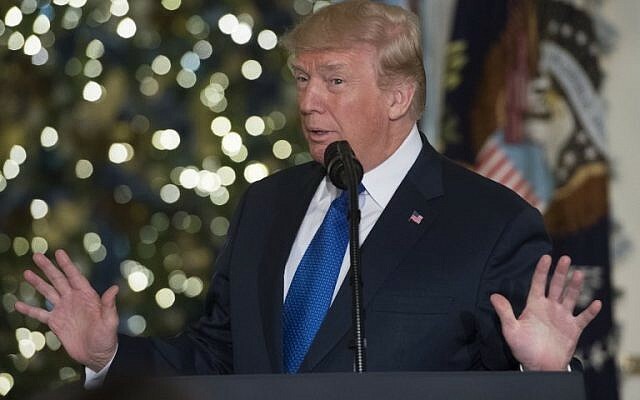 The tweet came a day after Trump suffered a defeat at the United Nations General Assembly, which easily passed a resolution condemning his administration’s recognition of Jerusalem as Israel’s capital.Trump had warned before the vote that the US could punish recipients of foreign aid who voted against the US at the General Assembly. On Wednesday he said countries “take hundreds of millions of dollars and even billions of dollars, and then they vote against us. It was not clear whether Friday’s tweet was in reference to this threat, as the full text focused on the need for bipartisan support for investment in infrastructure.A total of 128 countries voted in favor of the UN resolution Thursday, defying Trump’s threat, which was forcefully reiterated in an address before the vote by US envoy Nikki Haley. Nine countries voted against while 35 abstained and 21 were no-shows. Haley upped the ante further in a speech just before the vote. Not only was foreign aid in the crosshairs, but US funding for the United Nations was, too, she said. Haley said the United States would “remember this day” when it was singled out for exercising its sovereignty. The ultimatums from Haley and Trump did not dissuade almost all the top recipients of the billions of dollars Washington gives each year, to help with security, development and other needs, from voting to reject Trump’s recognition of Jerusalem as Israel’s capital.Soon after, in Washington, State Department spokeswoman Heather Nauert said cuts to countries that opposed the US were not a foregone conclusion. Trump has often credited himself with restoring America’s credibility when it issues threats by following through when US adversaries cross “red lines” that he has set. Of the top 10 beneficiaries of US assistance this year, only Israel voted “no” at the General Assembly — unsurprising, given that Israel’s government is overjoyed by Trump’s recognition of Jerusalem. All the rest defied Trump by voting “yes,” with the exception of Kenya, which didn’t vote. Afghanistan, for which about $4.3 billion in US money was set aside in 2017, voted “yes” to rebuke Trump. 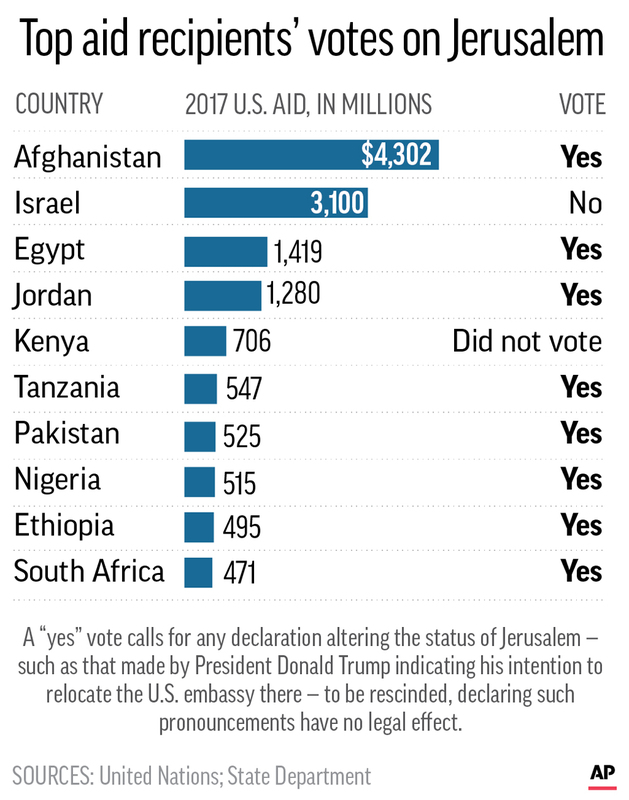 The “yes” votes included Egypt, which received roughly $1.4 billion in US aid, and Jordan, which received about $1.3 billion. Although both Arab nations are close US security partners that rely on American dollars, both would risk political upheaval at home if they did not voice opposition to the idea of Jerusalem as Israel’s capital. The man is an idiot, a complete idiot.